Silently, the breadcrumbs slipped back into the deep woolen pockets. They were supposed to feed the fish in the Donaukanal on a cold autumn day. But this time, it was different for the small group that gathered by the river for Tashlikh, as is Jewish custom on Rosh Hashana, the Jewish New Year’s Day. It was the first time the new chief rabbi, Arie Folger, led the ceremony and, as he explained, throwing bits of bread into the water – symbolically tossing one’s sins away – was actually not part of the tradition. “But that’s the fun part!” whispered a young man to a friend, while the others struggled to focus on the rabbi’s sermon over the professional/lifeguard diving team sorting its equipment just meters behind. Finally, with the rabbi besieged by well-meaning queries, the two men get a chance to toss some crumbs into the grayish water. They smile, satisfied. It was a good start for the New Year, but also one with surprises, some cheeky defiance and a watchful eye. Just the way Jewish life in Vienna rolls forward these days. The community, once the biggest in Central Europe, currently numbers 10,000 members within the official governing body, the Israelitische Kultusgemeinde (IKG), with estimates of the total Jews in Vienna going as high as 20,000. But no one is quite sure. In recent years, the community has been growing, and fast. Jews who have just moved here will encounter an established community – itself shaken up by the arrival of thousands of Jews from Central Asia in the 1990s. It’s really several communities in one, each with its own traditions and preferred way of Jewish life. The IKG represents all of them, presiding over an impressive Jewish infrastructure that includes a new campus on the edge of Augarten, opened in 2009, hosting the Maimonides retirement home as well as the Zwi Perez Chajes school teaching 700 children and adjacent facilities for the revived Jewish sport association, Hakoah. In Vienna, there are 16 synagogues and Jewish houses of prayer, catering to groups as diverse as Orthodox Judaism, the Sephardic-Bucharic faith or Reform Judaism. Their common aim is to tend the flame of an ancient culture that was almost erased. But it’s not only officials lighting the fires of Jewish Vienna. Sagi’s upbeat perception of his adopted home contrasts sharply with some who grew up here. Daniel, a 25-year-old Viennese who works for the Jewish community, often wears a baseball cap over his kippah when he’s out on the street. He draws a distinction between Austria – the country whose passport he carries – and the city he calls home. “Vienna is something different,” he says. Daniel’s grandparents were among the few to return to Central Europe after World War II. Of the more than 200,000 Jews who lived in Austria at the time of the Anschluss in 1938, only around 2,000 remained after the war. Many have left since then but others have come: In the 1970s and 1980s, more than 260,000 Soviet Jews emigrated via neutral Austria to Israel and the United States, with some deciding to remain here. After the fall of communism, even more followed. Still, Austria’s past affects the city’s approach to its present. One example is the Jewish Welcome Service, created in 1980 to bring émigré Viennese back to visit their former home town. Over three thousand survivors and their descendants have since made the trip, from places as diverse as the U.S, Israel, Denmark and Uruguay. “More than anything, it is about getting official recognition, being welcomed here in a new and different Vienna,” explains Susanne Trauneck, program coordinator since 1996. “For many, it is a profound, healing experience.” The visitors’ schedule is packed with official receptions at the Rathaus, the president’s office, concerts and the like, but searching for their very personal roots and memories is at least as important. Of course, they also meet representatives and citizens of today’s Jewish Vienna. Rachel, a young medical researcher and amateur filmmaker whose family is from Eastern Europe, believes that Vienna’s Jews have it relatively good, thanks to the Verbotsgesetz outlawing anti-Semitic statements in public. In Budapest, by contrast, Rachel and her husband chanced upon an overt neo-Nazi rally while walking in a public park. But Austrian anti-Semitism prevails in a subtler form, noted Anna, a retired civil servant born in Vienna, over coffee in her elegant, high-ceilinged living room. When the occasional anti-Semitic remark is highlighted, the automatic excuse is “Wir haben es nicht böse gemeint” – we meant no harm. Yet Hannah puts such remarks down to ignorance more than xenophobia. Whereas in the U.S., the presence of a large Jewish community has created widespread awareness of their concerns, many Austrians have no idea that they’ve ever spoken to a Jew, she suggests. “You have to explain more,” she said. There are also other ways to reach out and tell the stories of Jewish life in Austria. The Austrian Heritage Archive, a website which went online this October, presents the life stories of 12 Viennese who were forced to flee the country before and during World War II. It is only a small glimpse into the more than 600 interviews with survivors that have been recorded over the last 20 years by volunteers – many of them them young Austrians serving as Gedenkdiener (an alternative to military service), in cooperation with the Leo Baeck Institute in New York and Jerusalem. “It is a way to bring these stories back to Austria,” said Philipp Rohrbach, one of two historians who initiated the project. “But it is also about building bridges between an older and younger generation of Austrians – and hopefully show ‘a different Austria,’” added his colleague, Adina Seeger. But identity has internal as well as external components. Depending on whom you ask, Vienna’s Jewish community is either united – or deeply divided. The reality is that a large group is Jewish Orthodox in some form. The Reform Community – a liberal approach to Judaism originating in 19th century Germany – is small, with about 150 members, while others simply keep their distance. Conservative Judaism, a compromise between the Reform and Orthodox traditions, is almost non-existent. This is the exact opposite of the U.S., where the largest group is Reform, followed by Conservative, then Orthodox. Although there are differences, everybody identifies with the larger Jewish community, Anna clarified. “As long as we discuss things and don’t fight, it’s ok,” she said, “there should be room for different opinions.” Hannah hopes this is the case. She is a member of Or Chadasch, the only Reform Jewish synagogue in the country. As evidenced by its trilingual prayer books, this community views “pluralism as its basis,” and is more open for newcomers. Meanwhile, Jewish cultural and culinary life is blooming. 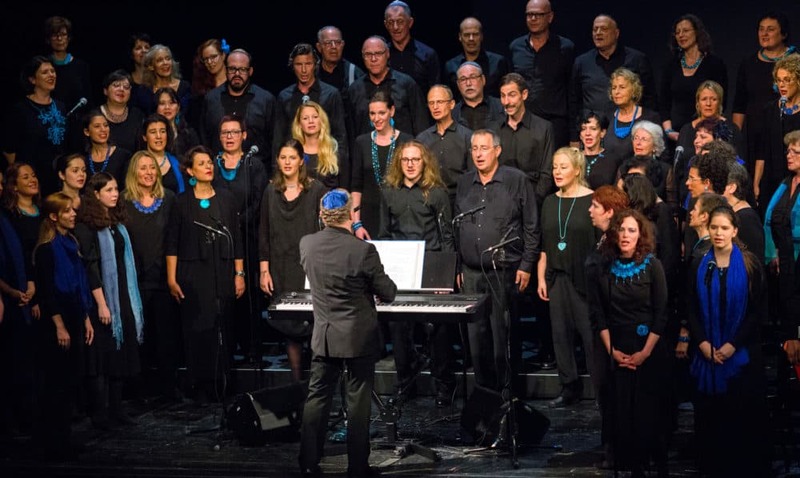 At the Kibbutz Klub, a periodic Mizrachi music party event, you can feel the Oriental buzz while dancing under rainbow flags and shimmering stars of David (see Metropole, April 2017, “Rainbow Sabbath”). The annual Jewish Film Festival draws audiences with films like Louis Saul’s and Mica Stobwasser’s The Taste of Israel, whetting the appetite for more. And then there’s the acclaimed “fast haute cuisine” restaurant Miznon, and Neni, the culinary empire of the Austro-Israeli Molcho family famous for the (arguably) best hummus in town. Founded by matriarch Haya Molcho in 2009, the popular restaurant now has branches in four German cities and plans to open three more in Amsterdam, Paris and Majorca. You can even buy their products at Spar. 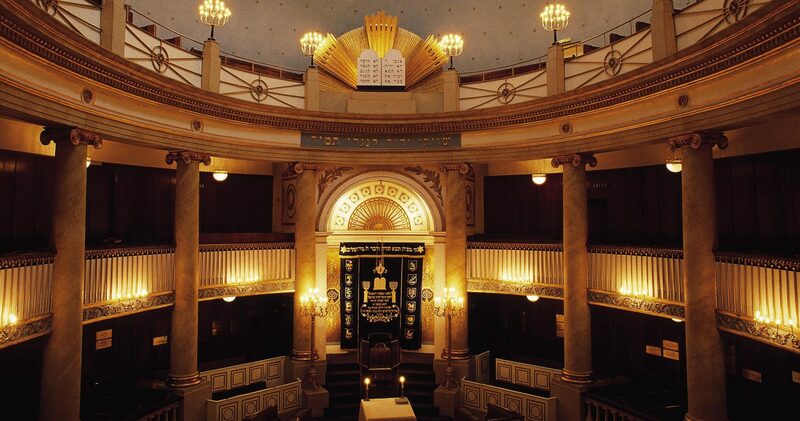 The Stadttempel in the 1st district is Vienna’s only synagogue predating World War II. Just next to it is a kosher restaurant, where a friend and I headed for a traditional Rosh Hashanah dinner. A long table is prepared for mainly secular or moderate Jews, but just next to it is another, smaller table, where the children wear long payots (side curls) and an elder dons a large round shtreimel (traditional fur hat). Before it comes to the rituals over the dinner – apples dipped in honey for a “sweet year,” or fish as a symbol for abundance and fertility – the organizer of the group we joined begins reciting the Kiddush (sanctification) of the wine. Quickly, our neighbors join in and add their own prayers and wishes in Hebrew and German, for us all. Soon, we dine and celebrate together, secular, Reform, Orthodox and gentile guests. In those moments when the protective layers can be chipped off, the mosaic uncovered is brilliant indeed. Previous articleAdvertorial | MyHive – What if you Could Take Care of all Your Errands While at the Office? Special Report | Can Austria Help Bring the Balkans Into the EU?